The number of children who are homeschooled has grown slowly over the years but shows no sign of dropping. The last reliable statistics from 2013 say 1.7 million children who would be in any grade K-12 are home schooled. This is about 3.4% of the school age population. Homeschooling statistics in Arizona count children between the ages of six and 16 as of September 1, according to the website A2Z, which I highly recommend you visit if you’re considering home schooling your child. Parents can pretty much create their own curricula for children under age eight, but they must follow a state curriculum when their children turn eight. We sell textbooks for homeschooled kids. We carry a number of textbooks to support homeschooled students . Most of these texts are for students in the equivalent of grade (primary) school, including kindergarten and pre-K. 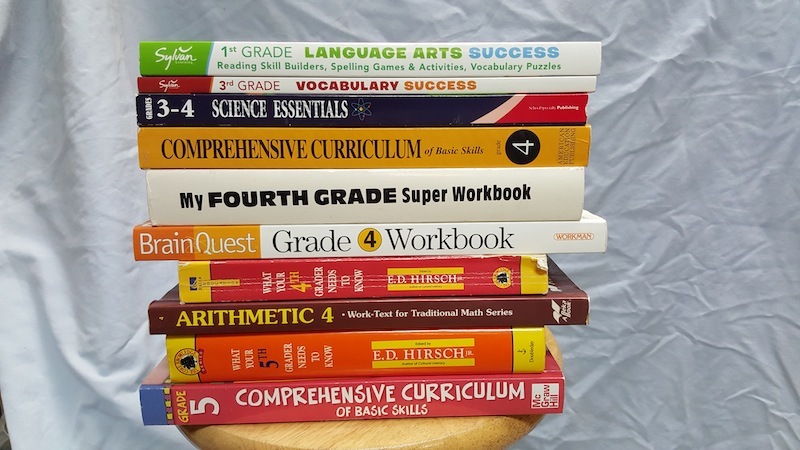 Some of them are comprehensive grade workbooks, while others focus on topics like science and language arts. They’re also useful for parents who want to provide additional instruction to kids who need extra help or who want them to retain what they’ve learned during the school year over the summer break. We carry other educational tools including flashcards, LeapFrog and VTech accessories, and science kits. Call us and we’ll be glad to tell you what’s currently in stock. We also have bookcases stuffed with books, DVDs, and even VHS tapes. Why are People Homeschooling Their Kids? The National Center for Education Statistics asked parents this question in 2013. The environment of the local school was the leading reason. I thought more parents sent their kids to middle and high school after homeschooling in the early years but the Department of Education statistics don’t bear this out. Middle school and high school students dominate homeschooling statistics by about 2 to 1. They consistently outscored public, private, and Catholic high school students on the GPAs, ACT scores, and in the number of credits accepted for transfer and GPA for those credits. While their ACT math scores equalled those of Catholic high school graduates and were slightly lower than those at other private schools and public schools, they blew away the competition in English and reading ACT scores, scoring a full two points or more. Their science ACT scores were higher than students at all other types of schools. But these are students going to college. I didn’t find anything on the percent of homeschooled kids who do go to college. And it would be interesting to see more recent research than Cogan’s. AZ Kidz n More New Location is Open!